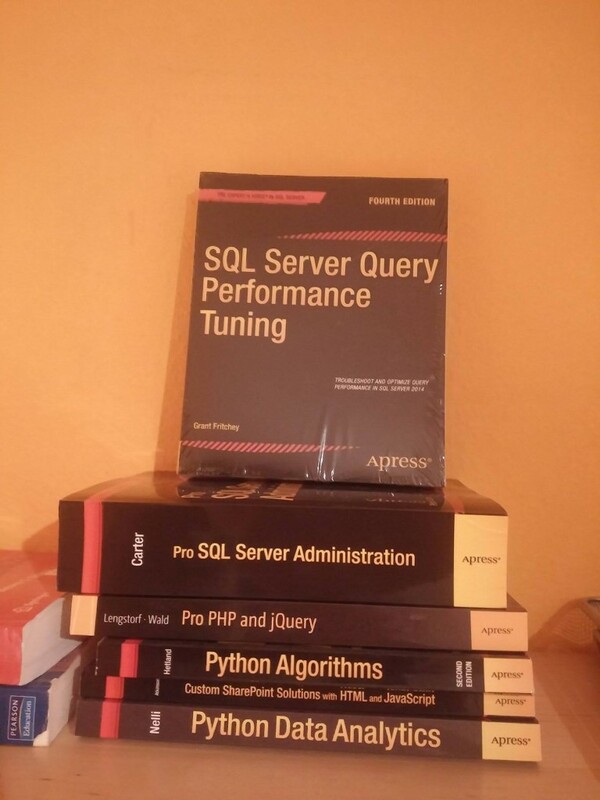 In August 2016 I have decided to review a few SQL books – thus, Apress.com has provided me with 5 high quality books, upon my request. Now, about 5 months later I am writing the review of the last one, with the experience of a person, who has passed successfully the MS 70-461 exam (Querying Microsoft SQL Server 2012/2014) about 3 months ago. The book is about Query Performance Tuning. After taking a look at the contents and the SQL Server Performance Killers, listed in the first chapter, one realizes that the book is written from someone with experience – the listed problems were ones I have also met in my life as a developer. In the next chapters, the book analyzes them one by one, showing how to avoid common pitfalls. In order to go more into details, I have to say that I liked the way the chapters were written – e.g. in the chapter, explaining the cursors, the author made a point that cursors should be avoided, but still explained how to work with them. In general, I am very satisfied with the book. The book is good and detailed. A small tiny minus – there were 2-3 figures in the book, where the text was unreadable. Thus, I am giving it 5 stars.